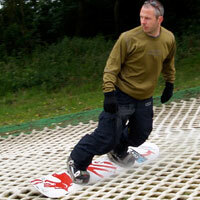 Are you a community group or do you have a group of friends looking to go Skiing or Snowboarding? Then GO SKI GO BOARD can help you. GO SKI GO BOARD will help you to set up a link between you and your local slope or club and provide all the support needed to those organising this programme, as well as the marketing resources you need to get the word out from posters and screensavers to booking forms. Are you just looking for yourself? Open community sessions are happening all the time – use our Find My Nearest... search to find one near you. Find the nearest participating slope to you using the Find My Nearest... search. This will also highlight the slope's community offer. Register with Snowsport England now to become a Snowsport Maker to access the downloadable support resources to help you find people to sign up. GO SKI GO BOARD Communities is about getting local community groups out on their local ski slope, getting fit and having fun with friends old and new, no matter what the participant's ability level may be. Session are run over 6 hours ideally spread over 6 weeks and can take place at a time suitable for you (restrictions apply). The person organising the group is known as the Snowsport Maker and there are a number of resources to help you along your way. "But Snowsport is expensive!!" we here you say. Well chill out. This programme offers an all-inclusive price with the price you see being the price you pay – no extra for equipment, clothing, lift pass or instruction. We think you'll be surprised - it's cheaper than you think.